Martha of Uniform Studio is putting a few things in her shop today, including some sale items and these amazing scarves. grab them up quickly as they always sell out. I’ve got my eye on the cayenne one, but as I’m on a sort of spending hiatus myself, I’ll have to just look and really really want. i am on that very hiatus. 2 months to go. as for the scarfs, just beautiful. 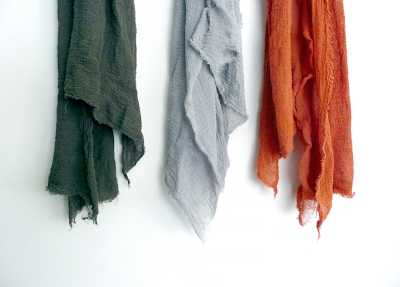 i love those scarves, the textures, the colors, just lovely. i’m on the spending hiatus as well, not so much by choice but too many bills at the moment. i was at target last night and had to tear myself away from buying the most perfect purse. dang! thank you alyson -so sweet of you to post about my update.